It’s quite hard to categorise a game that tries its hardest to defy categorisation, but it’s often something that needs to be done, in order to inform the consumer what they will experience. 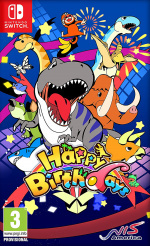 Happy Birthdays is best surmised as a sandbox game which, while layered with wonderfully cute visuals of flora and fauna, is about stats, numbers and nuance. The concept is simple and deftly hides the baffling number of intricacies that you’re faced with when you first open the game. Admittedly, there’s a charming little sprite called Navi who attempts to guide your journey, but – and Navi freely admits – it’s a lot to take in. As Happy Birthdays opens, you’re told about a map you find in the pages of a book. It must be a treasure map, thinks your faceless avatar and off you toddle to investigate. This all takes place in a non-playable intro; a narrative opening which sets up an odd transition into you becoming a terraforming deity. 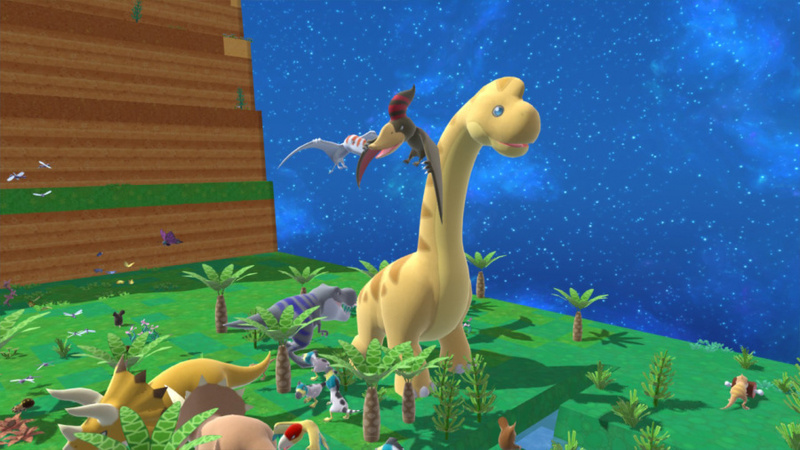 This game comes from the frankly genius mind of Yasuhiro Wada, creator of the Harvest Moon series, so you can see where the scope of the project comes from, plus the whimsy within the stylistic choices in the design. It would be remiss to not comment on the fact that Happy Birthdays looks at environmental change and how it affects life. In terms of global politics, it goes far in teaching you how a world works, which leaves a lot of wondering as who this game is for. Kids will surely fall for the lovely look of dinosaurs and landscapes, but will unlikely be captured by the deeper aspects of the gameplay. 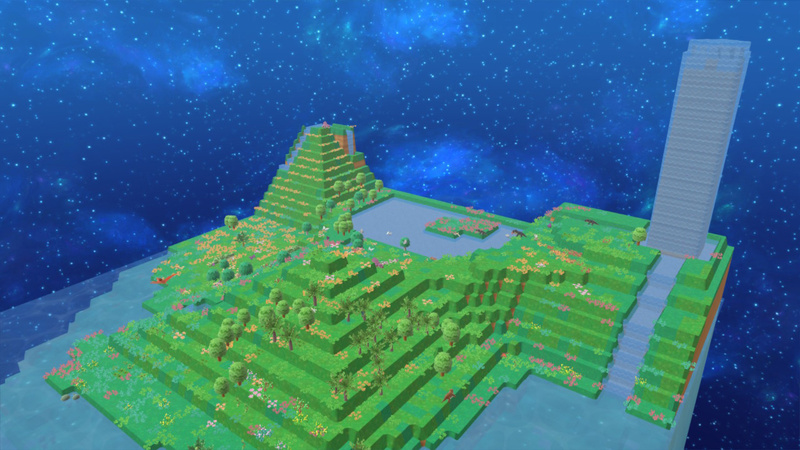 So, you’ve ended up in this bizarre world where you’re urged to pick a cube – grass, desert, stone or snow – grass is the starter zone, so it’s best to choose this. Navi tells you that this tiny cube represents the entire planet. It’s a small slice of a big cake. Here begins a 20-minute tutorial (which plays each time you start a new cube, though you can skip through the dialogue by rapidly pressing ‘A’) about how to move your avatar, zoom your view in and out and, most importantly, terraform the world. This latter skill is done by raising and lowering the land, which affects the temperature of the biome. Doing so allows specific animals to appear, evolve and procreate. While this idea is simple and actually incredibly interesting, it goes even deeper. You don’t just need to think of temperature, but also humidity, the height of land, its proximity to water and even the depth of the sea. All of these factors must be taken into consideration when attempting to spawn either an animal or plant. Thankfully, there is a record book in the pause menu that not only tells you what can be created, but also how, and you can even view it as a family tree enabling you to choose a base creature and observe how the environment needs to change for it to evolve. Of course, it becomes a very fine balance; maybe you want to increase the temperature in order for an animal to appear, but doing so may kill off a plant that can only thrive within a cooler setting. Adjusting the land is as simple as holding ‘R’ to raise or ‘ZR’ to lower the ground and you can scroll through the size of the grid-like area of effect with the D-Pad. There are special abilities to use which can instantly create pools or hills, even boost productivity of plants or animals and using these requires energy created by terraforming. More terraforming equals more energy, more energy equals levelling up and unlocking more abilities, which all comes back around to more terraforming. And while it all looks lovely, it’s not much fun. There’s a lot of passive gameplay; lots of recharging your HP – which falls as you terraform the land, but you don’t die – while time in your cube flows and scientific names pop up in the list of new life. To do this, you must come into Macro Mode which is a zoomed out version of the world. But doing so means you can’t watch the new life appear ‘in the flesh’, it all happens on a quite boring looking list. Zooming back in, time pauses and though the dinosaurs and other exotic animals wander around, it feels a bit lifeless. There’s no soul, despite the depth in the mechanics. As a learning experience, Happy Birthdays is an interesting experience. Experimenting with the ecology and evolution is very different to other sandbox or life sims and you’re often encouraged to play and explore, causing some species to die off as they are no longer needed in the world, allowing others to take their place. For much of the time things happen a little too fast , when they do happen– an animal can spawn and die quickly if the biome changes rapidly and the game gives you very little direction. Clicking the right stick causes Navi to hint at what you should try to create next, but without any linear progression it becomes a simulation in pressing buttons and reading lists. For someone who wants to micro manage, the game offers a lot of potential, but for others it can lead to tedium. It's frustrating that the wonderful level of charm in the style isn’t reflected in the playing of the game. A challenge mode sets you the task of taking on a world already in flux, asking you to spawn a certain dinosaur, but they aren’t fun. 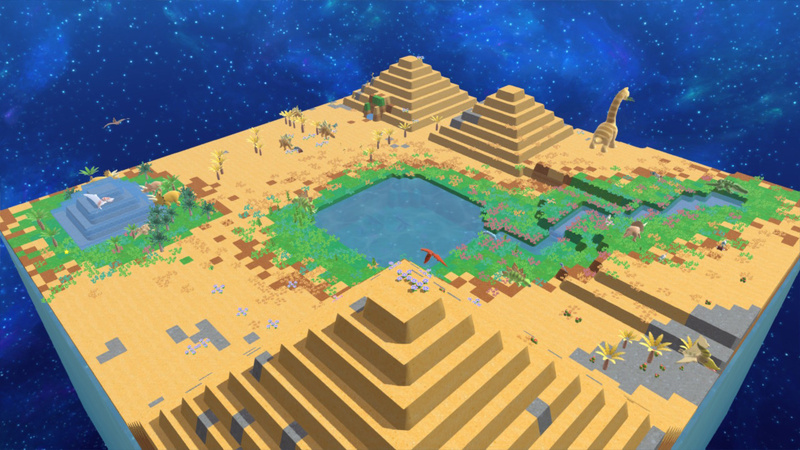 Choosing the other biomes increases the difficulty of balance and significantly slows down the evolution gameplay to a glacial plod. If you’re coming to Happy Birthdays for the dinosaurs, you may very well be put off by the lists and balance of mechanics. The saccharine visuals and bold colours will easily attract the eye and when new species appear you’ll be begging for a photo mode. But that’s only if you aren’t looking at the endless lists or stats, or charging the ever-depleting energy banks. Interesting, educational and pretty, but ultimately soulless and a little boring. I feel like Endless Ocean may been a better simulator than this. @Paraka Endless Ocean was a nice little gem for the right person. I'd enjoy something similar in HD. 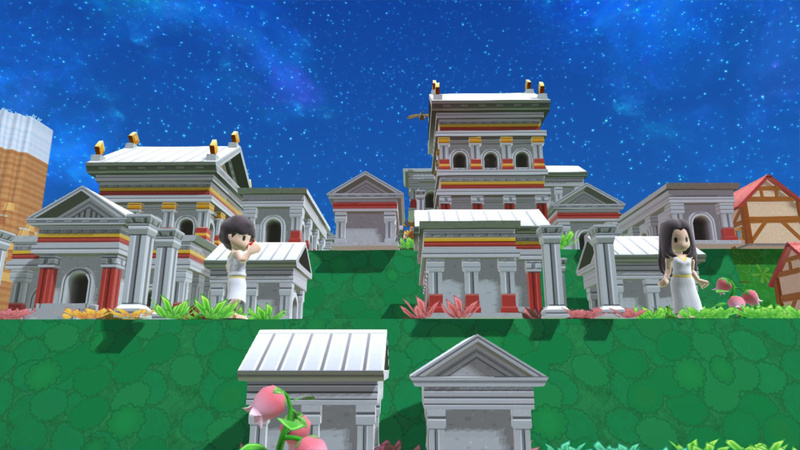 It's a cool concept and it looks cute but the demo just wasn't enjoyable for me. I won't be picking this up but it's nice to see NIS bring more games to the Switch! @frogopus - When this game first released in Japan, I had such an EO vibe from it, but more whimsicle. And an EO3 I'd definitely be down for, they're so mellow and laid back. @Kimyonaakuma I agree, the demo wasn't for me either. And after reading some reviews, this one included, I know for certain I'm going to skip it. Looks neat, but not for me. Been very excited for this game. Evolution themed games will always grab my attention and I was digging the demo. I do get the feeling that this is one of those niche games that will likely drop in price swiftly over the next month or two so I'll probably wait for that to happen. I understand the criticism, but I actually had a lot of fun with the demo. Tweaking the environment and aiming for different evolutions made for a nice, relaxing time, and I could use that kind of game right about now. Ha, my birthday is today. I kind of chuckled internally when I saw this. I played the demo for three hours and finally decided to stop so I could buy the full game and start over. It’s not for everyone but I really like it. This is not for me, but does look cool for those who like this sort of game. I love the constant flow of "new" ideas on this platform! This game seems... okay, nothing that gets me excited really. It doesn't need a photo mode... at least on Switch. Unless you mean one like Odyssey. When my daughter found a video playthrough on this game for the PS4 version months ago, she had been non stop asking me for it. When I got the demo for the Switch last week, she played a few hours and then that was it, went back to Dragon Quest Builders. Loves the concept for it, but doesn't understand the controls, yet. So I will more than likely be picking this up at some point. If it wasn't for the fact that the game goes live tomorrow, I probably would have picked it up already for her, but now I have an excuse to save my money for the time being. i enjoyed it to a point but figured it out to easily even created a max rarity prehistoric creature that looked like a giant shrimp uncurled kind of. edit: this was from doing the demo which gives u most of the game. I had tried the Demo , but.... i felt disappointed due to not really impressive way to shape the terrains. It felt like Minecraft style of Sim City. Well... back to Portal Knights. @Anti-Matter What? You're talking about Minecraft and you go back to Portal Knights? Lol. It seems though a lot of people don't really know how to play the game though... didn't think it would be this difficult for a lot of people to understand. This isn't directed at you btw Anti-Matter.